Communal worker at Manchester; born at The Hague, Holland, in 1834; died at Vienna on Oct. 14, 1899. He was senior partner in the firm of Messrs. S. D. Bles & Sons, merchants and shippers of Manchester; from which firm he retired in 1897 in order to devote himself to philanthropic pursuits. Bles was a city magistrate for thirteen years, being elected in 1886; and for many years he held the office of vice-consul of the Netherlands. In the year 1897 the queen of Holland conferred on Bles the Order of Orange and Nassau. He was president of the Manchester Jewish Board of Guardians; manager of the Manchester Jews' School; a trustee and member of the Council of Founders of the Manchester Reform Synagogue; a member of the Hospital Sunday Committee and of many other charitable organizations. He founded at the Victoria University a Bles Hebrew scholarship. 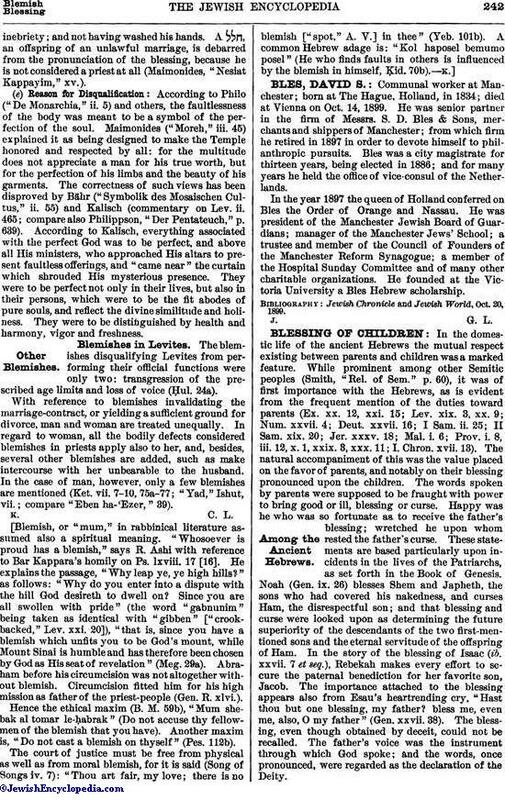 Jewish Chronicle and Jewish World, Oct. 20, 1899.